This program has given me light and purpose during a dark time in my life. Focusing on the well being of these dogs instead of all the drama and chaos in here has helped me survive doing this time. I have learned to put the needs of another creature above my own. I will be able to walk out of this facility having actually learned something about myself and dogs. Thank you Ms. Janette and Ms. Helen for allowing me to participate. This program saves not only the lives of dogs but our lives as well. Spanky has been my one and only friend in here and I will forever miss the little guy. He and I had a bond I will never forget and I am proud to say that I was able to a part of his life. OMG, you have no idea how excited we are. I can’t thank you enough, this is a life changer for me! These dogs were rescued and trained, and now have another chance at life. That’s what I feel the program has done for me. I also have been rescued, trained, and now I have a new chance at a better life. I wanted to thank you very much from the bottom of my heart. I was very grateful to be given the opportunity to be part of the Cell Dogs program. It gave me a sense of accomplishment and purpose. It was amazing to see the dogs improve and progress every week. I loved being a part of their transformation into happy dogs. This program is a lot of hard work, but knowing I helped give a dog another chance at life made it so worth it. I’ve come to realize that there IS such a thing as a second chance. These pups had been at a shelter facing euthanization if not adopted. As for me, I thought people would look at me differently after I was charged with a felony, that people wouldn’t trust me. But Helen and Janette didn’t treat me like a criminal; they treated me like a person. I feel very blessed to have had this experience. Through this program I have gained confidence in myself and hope for the future. Thank you for allowing me to participate. Cell Dogs is an amazing program that not only helps rehabilitate broken dogs, but also broken people. I love, love, love the Cell Dogs program and couldn’t be happier with its many successes! It has positively impacted our staff and detainees while training amazing shelter dogs to become loving family pets and service dogs. Their staff is passionate about their work providing second chances. I highly recommend this program! We are extremely proud to partner with the Cell Dogs Program. The trainers are very compassionate and knowledgeable, and the results are amazing! Dogs that have graduated from the Cell Dogs program have even better chances at becoming adopted. This program instills compassion and responsibility in the participants, helps shelter animals become adopted, and supports the human-animal bond. This is a win-win. My husband and I love Cell Dogs! Our story is unique because we actually met Milo before he entered the program. Milo was a very different dog before: he didn’t come from a great home and didn’t know how to interact with other dogs, was skittish and not at all obedient. Now that he’s graduated from training, he is so much happier and loving, knows how to play, and even knows a few tricks! He is an important part of our family. This program and all those involved with Cell Dogs are amazing. They care deeply for the animals and have given these dogs a second chance at life. Thank you for all your dedication to these great dogs and programs. Shaggy is still the love of our lives ever since his adoption in February of 2009! He enjoys life in Loveland, Colorado, with his three cat siblings. He was recently diagnosed with Cushing’s Disease, but he is getting top-notch treatment, and the prognosis is great. Of course his eyesight and hearing are not that of a young dog, but he is still the biggest sweetheart! Everyday we celebrate his life with us. I just wanted to say thank you to the Cell Dogs Program, and I feel so blessed to have been directly involved. I witnessed first-hand the positive impact it had on the inmates and the inmate trainers. Not only did the program give the dogs a second chance at life, it gave the inmates a sense of accomplishment and something to be proud of, in knowing they CAN make a difference with hard work and dedication. My Cell Dog Cowboy is such a big part of our family. He’s also helped our other rescue dog come out of her shell. Keep up the great work! When I worked in the unit next door to one that ran a Cell Dogs program, I borrowed Teddy to work with a youth who was afraid of dogs. The young man overcame his fear, and I fell in love with Teddy. Now Teddy is a great part of our family: my wife and our five kids adore him! I have worked with Janette (of Cell Dogs) for many years, and I believe this program truly helps these kids learn responsibility and care for others. Training, feeding, grooming, exercise, and play are all part of their job. I have seen many of the trainers become better versions of themselves through their participation. I’ve always said that a person who has a dog really knows what love is. Just like human beings, dogs often end up in jail because they have never been loved. In the Cell Dogs Program, they give and receive unconditional love and a second chance. This is also the best option among the jobs inmates can choose from, as it improves the lives of all involved. My wife Anna and I adopted the adorable and beautiful Rosie—she may have been a handful at first, but she is now well-behaved, playful, loving (she gives us lots of kisses), and the best car companion too. She also gets along well with our two German Shepherds Tara and Target, so we are all very happy in our house. 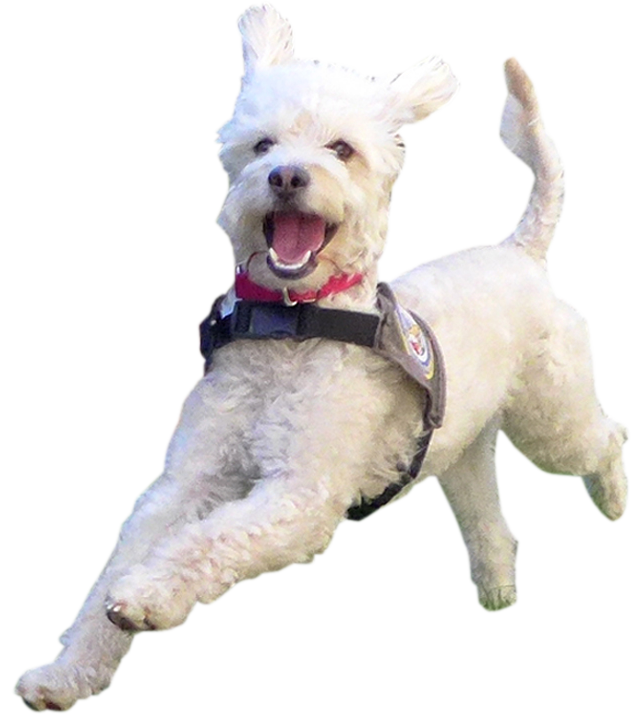 The Cell Dogs program at the California Institution for Women was inspirational. When the dogs arrived, they had an immediate positive impact on the culture of the facility. The women who were lucky enough to become dog trainers learned how to be responsible and also to love something, often for the first time in their lives. This became a tremendous growth experience for them that extended well after the dog left prison to be given to its intended owner. Additionally, the women learned invaluable skills that translated into a vocation once they were released. Ollie is doing so well, and we are really enjoying each other! He enjoys car rides and has figured out how to have fun at the dog park. He is also a great watchdog. I get compliments all the time on how well behaved he is; he is great with people and loves the attention! He is my angel with fur. We’ve been so lucky to have Skip in our family! Sarah treats Skip as her best friend, and he continues to be an amazing bridge for her. His heart is full of kindness and patience, and he’s helped us so much in the last two years to become a stronger family. We’ll forever be grateful to Cell Dogs for training him so well and bringing him to us—we just cannot imagine our lives without him. We love our Trixie girl so much! She brings sunshine to our lives every single day. The Cell Dogs team did a fantastic job in making such a well-trained dog. We can’t say enough about how much we appreciate this program. Congratulations on your many accomplishments over the years! I am fortunate to be a part of your journey. I adopted my Squirt nearly eight years ago, and she’s been with me through thick and thin; she has always been so faithful. Most recently, she helped me train for the Los Angeles Marathon. I ran 20–40 miles a week for several months, and she never left my side! I can’t recommend Cell Dogs enough. It is a remarkable program for both dog and trainer. We have two dogs from the Chino Hills Womens Prison, and what the program participants accomplished was incredible—Griffin and Gracie are so well trained. I would highly recommend anyone looking for a dog to contact Cell Dogs. You and your dog will be happy you did! When we first met and adopted Ranger, we had no idea he would change our lives in so many wonderful ways. Ranger has been our best friend and companion, a loyal watchdog and constant source of humor. He’s adjusted well in our move to Texas and is loving his wide-open spaces to explore, chasing squirrels and deer, and is enamored with the turtle who shows up unexpectedly in the yard. Thank you for rescuing a truly special dog and bringing such joy to our lives. The Cell Dogs program at the Musick Facility is a great rehabilitative program for both inmates and dogs, and the impact on the facility has been nothing but positive. Since the program’s inception, I have seen its calming effect on participating trainers as well as all the inmates in the training barracks. The inmates are thankful for the affection from the dogs, the consistency and structure of training, and the sense of accomplishment they get with the successful placement of the dogs into forever homes. Each dog and inmate graduates from the program with a new lease on life. And the dogs make everyone, staff and inmates alike, smile. My experience with adopting a program dog has been great. Bear, my Boxer mix, is the sweetest most loving dog I have ever met. He is an amazing dog that wants every human he meets to pet and admire him! I am very thankful to have had the opportunity to be involved with the program and the program’s contribution to my family. Since its inception at Orange County Probation Department in 2009, 52 dogs have graduated from the Cell Dogs Program here and have found forever homes. Because of the dedication and passion of Janette Thomas, this program has had a profound impact on the youth who have participated, the animals who have been rescued, and the families who have adopted them. I believe that our partnership with Cell Dogs has assisted our department in achieving our goal of creating a safer Orange County through positive change. Some time after I had been diagnosed with breast cancer, Janette called to say she had come across a Lab that had been returned to the pound twice. We had seen the many successes over several years that Cell Dogs produced, and I also thought having a new pup would be good medicine for me. Bailey was an immediate hit with our 8-year-old dog Buddy, and she’s an energetic sweetheart that gets us walking several times a day. She’s been great medicine in my recovery and has brought a lot of joy to our home. We continue to work with her on her manners, and Cell Dogs provides support when we need advice. Thank you, Cell Dogs, for bringing Bailey into our home. We are lucky to have Jack in our lives, but we also feel a sense of satisfaction that Jack made a difference in the lives of others before he came to live with us. I can’t think of a better way to erase my unpleasant memories than to replace them with thoughts of all the good that comes from this wonderful Cell Dog program. Blossom is my right-hand pup who helps me with the simple things that allow me to be an active member of the community. She gave me my confidence and independence back. Blossom reminds me that, together, we can do anything we put our minds to. Blossom is a constant reminder that I am unconditionally loved. She is my best friend, and I don’t know what I would do without her. Ferbie has certainly changed our life in a wonderful way. He is now keeping our new Great Dane puppy on his toes, and Ferbie definitely is the boss! He changed our lives along with the lives of the young men who trained him. We love him so much! Dusty is compassionate and intuitive, able to sense if I am sad or upset, and is ready to jump on my lap to comfort me and offer gentle hugs and kisses. As he prances along beside my wheelchair, his presence helps me maneuver confidently in any environment. The two of us are often greeted by strangers, and I am offered the rewarding opportunity to share our story with them. I am often alone, and his companionship, eagerness to please, and just being present offers me such peace and comfort. The quality of his life and mine are both improved because we are a lovingly bonded working team. We need each other. We tell Frosty’s story to any and all so that others can benefit from this great program! Frosty made our family more loving and compassionate to others, and she’s enabled us to tell people about the dogs and inmates who need rescuing. Little did my husband know that, when he changed his mind about getting a dog, he changed our lives along with the lives of the inmates who trained our Frosty. They may have learned the true meaning of love for probably the first time in their lives, in addition to the skills to land a job when they got out. Knowing that Gracie had such wonderful trainers and could do so much, I decided to see how she would do as a therapy dog and, behold, I think this was her calling! Gracie loves meeting new people, and she has so much to give them. I realize how much Gracie has touched my life, the joy I get when we are out helping others. Without Gracie by my side, I don’t think I would be doing any of these things. A friend said to me as she was looking at some photos of me and Gracie, “Look you’re smiling, I rarely see you smile.” I truly believe Gracie was meant to be shared with all, unconditional love to me and all who we meet. Maddie is my shadow following me everywhere I go. My heart overflows with love every time I come home because she is so excited to see me. She runs around, stands on her hind legs, makes little noises, and does not settle down until I can pick her up and hug and kiss her. All my stresses from the day are gone in an instant. I recently lost my husband of 52 years, and my daughter and I were distraught and very depressed. Carson has brought us daily laughter, and he has greatly improved my health and lifestyle. I’ve always been a night owl and a sedentary late morning riser, and Carson has encouraged me to exercise more and adapt to his much healthier schedule. Regular mealtimes and bedtimes, walks, and play have literally improved my spirit, appearance, and outlook. Carson’s affectionate disposition and humorous antics bring comfort and fun to everyone he encounters. And he is extraordinary when he accommodates my needs. He patiently waits until I open my eyes before covering me with kisses and cuddling until I am fully awake. He politely waits until he is fed and never fails to thank me afterwards. He paces to my stride, even if it is unsteady, and he never fails to bring comfort and joy to me. I wasn’t expecting for Archie to change my life, but his 18 pounds of canine love has made my life better. He keeps me company when I get up in the middle of the night, is my gardening buddy, and keeps my lap warm while I’m watching TV. He is my constant companion. And even though I didn’t realize I had a void, Archie has filled my life with devotion and joy. I thought my life was full before adopting Archie, but I guess there is always room for more love. Five days after the death of my husband, Janette told me she had a dog for me. I was in the midst of preparing his memorial service. LuLu redirected my grief and became my reason for getting out of bed in the mornings. We’ve been inseparable ever since, six years and counting. She’s my constant joy. I could never repay Janette for pairing us. We are so thankful and blessed having you in our lives. Duchess and Biscuit are my kids, especially since our “real” kids are all moved out. I run them every morning at 4 a.m. and, if I move in bed at 3 a.m., they are ready to go! Duchess, a bigger dog who wasn’t chosen until we came along, is so smart and so sweet. Biscuit is the nicest and naughtiest little boy, so loving, so mischievous, and so needy—he doesn’t want to be separated from Duchess even for a short time! Adopting Kaya and Kobe from Cell Dogs was the best investment I have ever made. The program is a win-win-win situation. First, the dogs’ lives are saved. Then the program trainers get an opportunity to feel what it’s like to have unconditional love. And then, people like me get to adopt dogs like Kaya and Kobe to continue the cycle. We adopted Cookie in June of 2010. She is our protector, guarding us from all intruders in our yard, including ducks, squirrels, lizards, bunnies, birds, and humans. She loves her tummy rubbed and gives great kisses! Thank you for allowing us to adopt her. Being part of the Cell Dogs program has been an experience that I will remember and cherish for the rest of my life. Just being chosen to participate and be a part of this program, watching the transformation of the dogs, has been an honor and has been life-changing. Thank you for letting me be a part of this program. Being chosen as a dog trainer has shown me worth I had long forgotten I had. Training the dogs has been fulfilling and has given me a huge sense of accomplishment knowing that I’ve been a part of their second chance at life. Thank you for the experience. Through this program, I learned patience I didn’t even know I had. I love Duke as if he were my son. Thank you for showing me a whole new aspect on life with people and animals. I have learned so much in so little time. It has been just an awesome opportunity and I will carry these memories with me always. It has been a privilege to love these dogs and teach them, as well as knowing I’ve been part of the process of getting them into new homes with families that will love them forever. Thank you for allowing me to be a part of this program. It has been a blessing in so many ways.